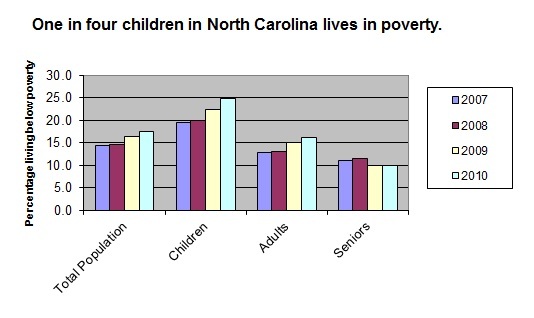 Last week’s BTC brief discussing the recently released American Community Survey 2010 poverty data noted that child poverty in North Carolina rose from 19.2 percent in 2007 to 24.6 percent in 2010. Essentially this means that since the beginning of the Great Recession, the share of North Carolina’s children in poverty has gone from 1 in 5 children to 1 in 4 children. Child poverty rates have risen all over the country. But North Carolina’s child poverty rate is not only increasing, it is increasing compared to other states. In 2007, North Carolina’s child poverty rate was the 15th highest in the nation and in 2010, the state rate is the 12th highest. Research has shown that child poverty can have devastating consequences including keeping children from achieving in school and even dampening their earning potential later in life. The Great Recession and the lack of a meaningful recovery has been especially hard for North Carolina’s children. Cutting back on the types of investments that provide opportunity for the next generation, such as public education programs, impacts our future prosperity and is a step in the wrong direction. These new child poverty numbers emphasize the critical importance of investing in our children and in working families.